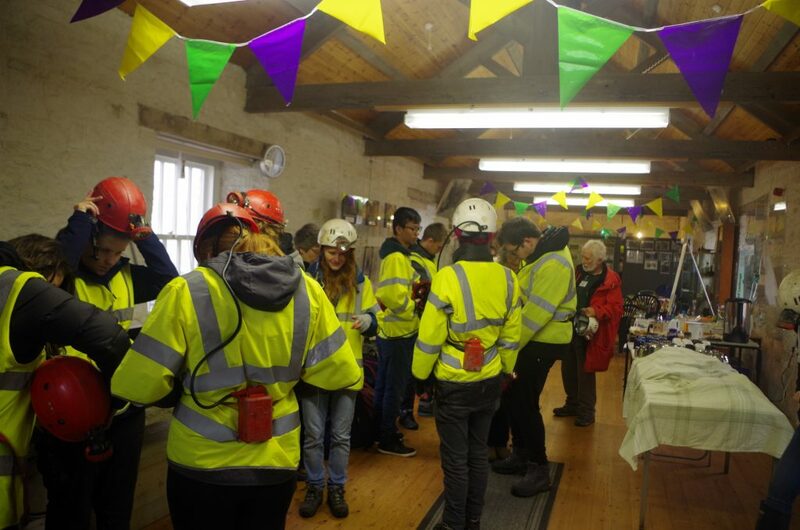 On 16th October we welcomed 50 students and staff from the Department of Natural and Environmental Sciences, Newcastle University. 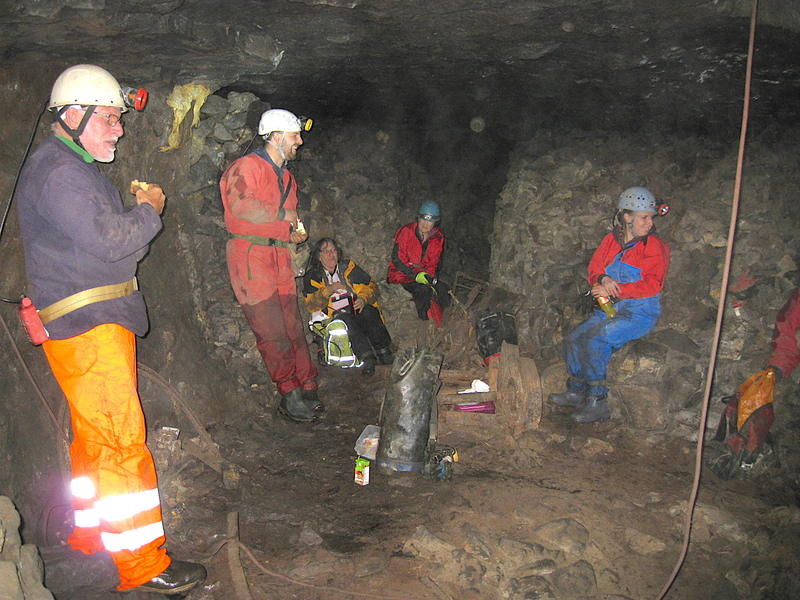 Our contribution required five group trips into Carrs Mine and supporting the groups on surface sampling. We started the day in cloud and drizzle and ended with blue sky. It was rewarding to see so many students taking an interest in earth sciences. Thanks to Dr Martin Cooke, Director of Postgraduate Studies and team for choosing Nenthead as a field study site and to our team of volunteers including Steve Holding, Alan Robinson, Dave McAnelly, Karen Beer, Chris Buckingham , Joyce Jackson, Gavin Stewart, Andy Hopkirk, Frank Bouweraerts, Anne Hopkirk, and Peter Jackson. The last planned Sunday work day for this year had great results. Several potholes and gulleys were concreted on the approach road. This consumed our stock of sand and cement, including some new donations of cement. After lunch we split into two groups. 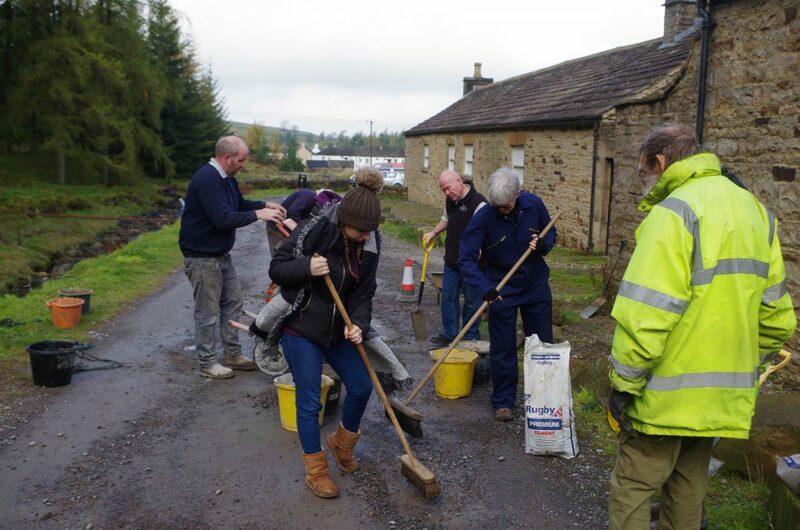 One team cleared fallen rock from the river adjacent to Carrs waterfall. The water level was dropped by at least one welly depth. Another team visited Rampgill Burn culvert intending to retrieve the stocks of dressed stone that were leftover from past conservation work. 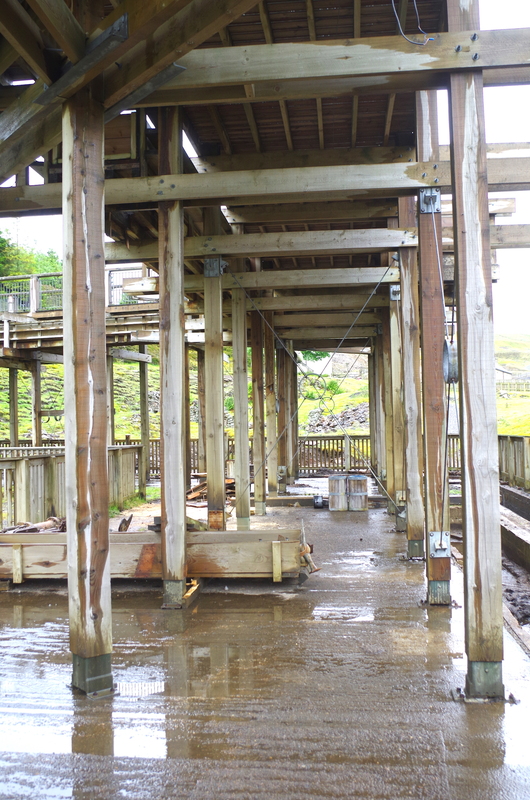 Stocks of stone now safely housed at Carrs Mine. 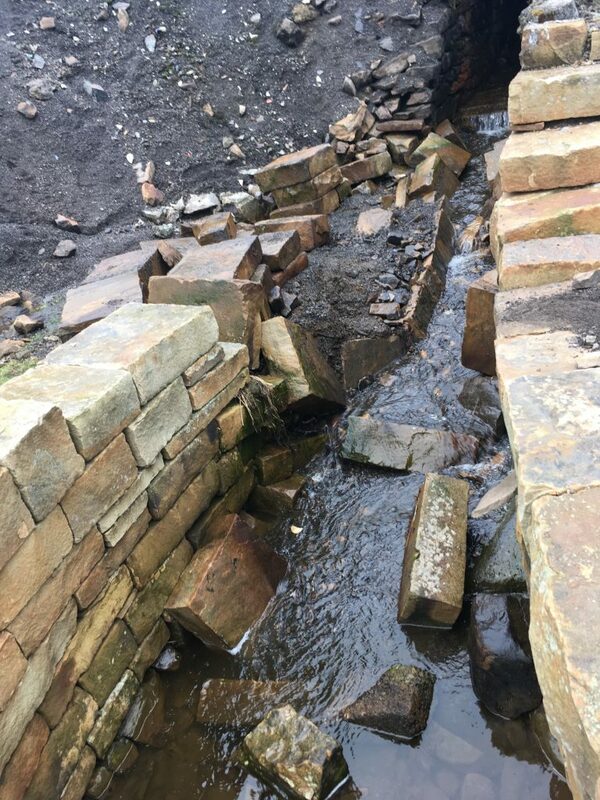 We also viewed a collapsed culvert wall and retrieved some fallen walling from the burn. Pending longer term repairs, this work will help to prevent more erosion of the silt on the burn side. 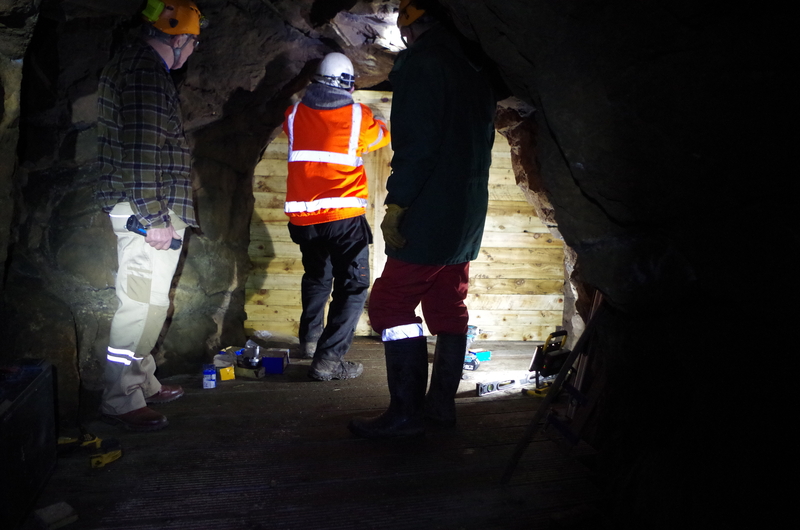 The day ended with a quick visit to Carrs Mine in order to inspect and prepare the mine for a visit on Monday. Members Underground Trip 23 September 2017. 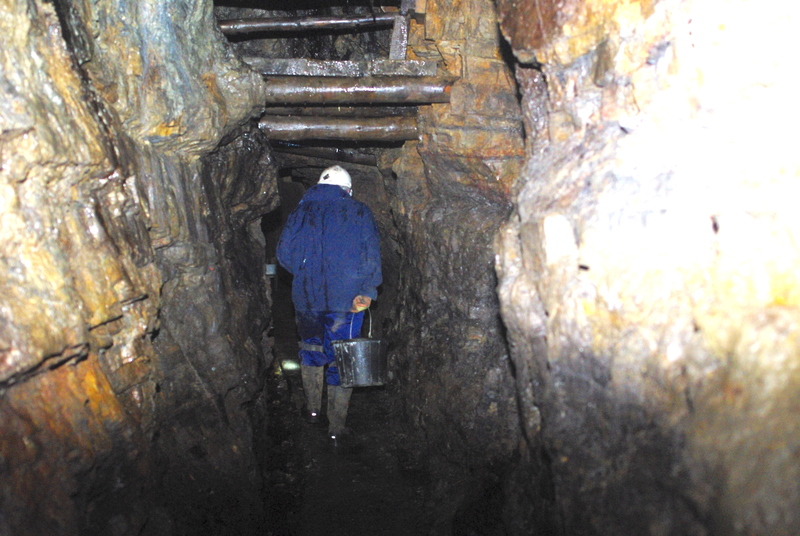 An Introduction to parts of Rampgill mine for our new members was advertised by Pete J as having water no more than 0.5 metres deep. 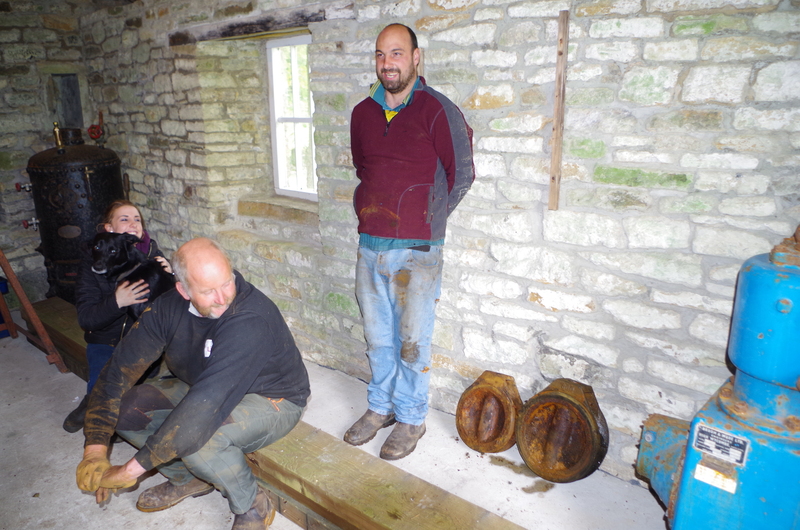 A tour of Scaleburn whimsey, Rampgill Engine shaft and Hangingshaw Branch level revealed the horrible truth…that Pete still has not grasped metric measurements – the water depth is 0.9 metres. The next day was a Sunday members volunteer work day and we found ourselves working with water again, but in better conditions on surface. Pete rapidly disappeared up the valley with Sheila – trying to avoid the comments about tape measures and metrication. Sheila and he were gathering thistles ( they said). Chris(2), Will and Rachel collected the scrap timber which has been lying at Hodgsons High Level for 3 or more years. Audrey got a dry job inside painting the Barracks windows. 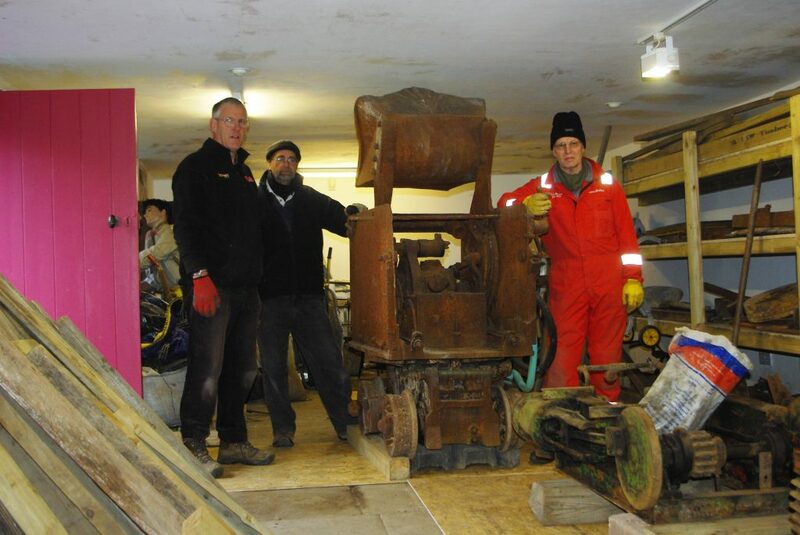 Chris(1), Allan and Jim toiled in the Stagg waterwheel pit and removed rubbish and scrap that has been thrown down. They also stacked useful building stone from the pit bottom for possible future use and discovered that part of the tailrace tunnel is in need of repair. They managed to persuade Head Ganger Joyce to barrow the rubbish down the hill to the skip. Chris(2), Will and Rachel then cleared out some scrap wood from the Power of Water site before starting conservation work on the Brewery Shaft external pipework. 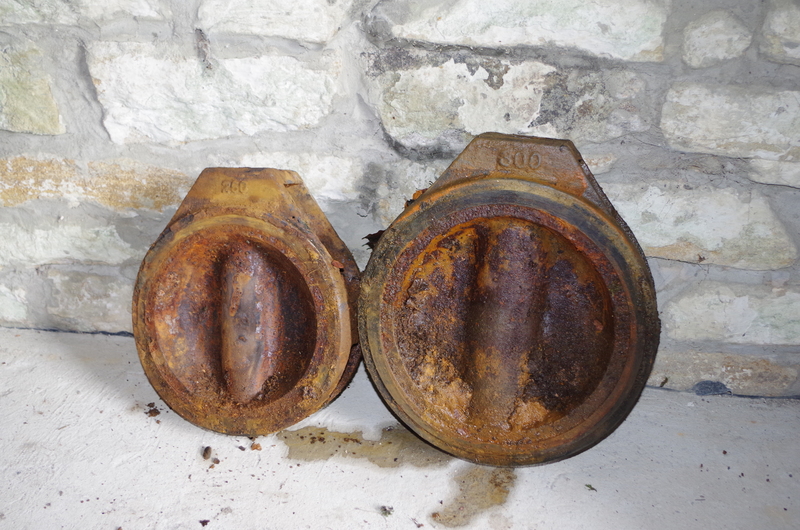 Water has been trapped in the valves and they found that the valve gate could be removed which allows the water to drain, and the pipes to be given a protective coat of paint. Pete was instructed in the meaning of the metric measurements cast on the gates. Nick was spotted trying to get the squawk box to work correctly – is it full of water? Jim, Allan and Pete dismantled some stone structures that have appeared around Firestone level. These creations incorporate stone seats and fire pits, with stocks of wood. They managed to dismantle two of three. 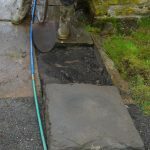 We think that we have an intruder who is ignoring the normal polite niceties of behaviour about not building on someone else’s property – whilst also remembering that the land is an Ancient Monument. Chris(2) and Will were viewing the flood damage on the smelt mill trackway when they discovered evidence of a possible culvert just south of the smelt mill flue. We plan to get permission to dig trial pits in this area. 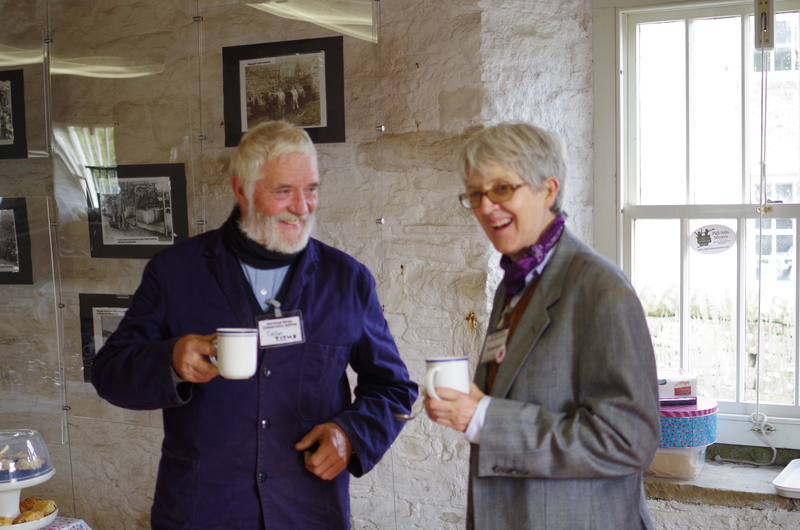 The Heritage Open Days weekend started on Saturday morning with a prospective quiet day which was not to be. 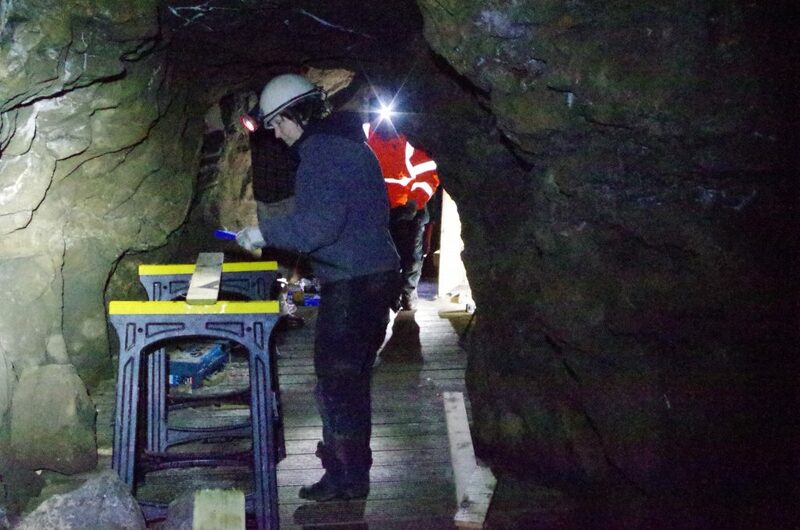 The morning mine inspection revealed a break in at the Carrs Mine waterfall exit, with damaged door and woodwork, damaged mineral specimens, missing specimens, moved mine wagon, and evidence of the most basic human behaviour. Most of this was sorted before the first visitors arrived, but the door had to wait until Sunday. Heavy rain showers. The damage to the mine was the second incident in a fortnight. Two volunteers endeavoured to find replacement door hinges in the afternoon of Saturday but without success – all the outlets for miles were out of stock. A phone call to another team member (who was forty miles away at the time) eventually got us some hinges delivered late on Saturday. The door and frame was fixed on Sunday. We now have the incidents logged with the Cumbria Police, crime number allocated, and another bump in the crime stats for Alston and Nenthead. However…good things happened elsewhere. 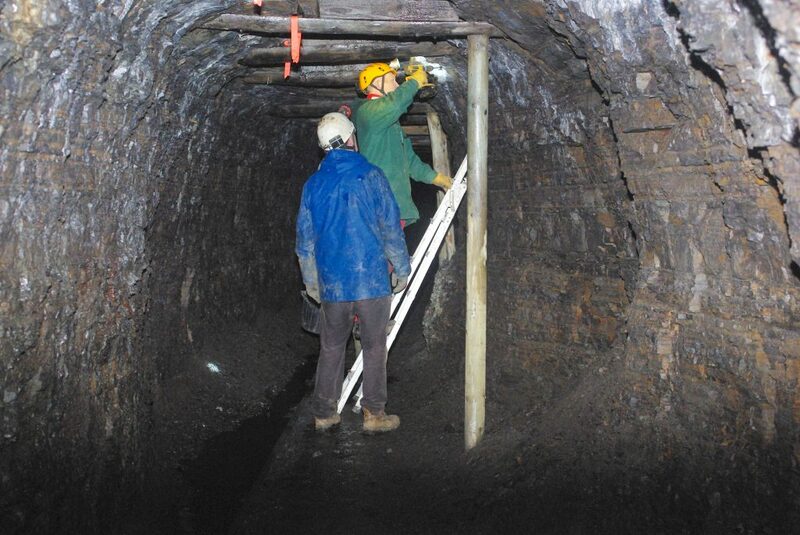 The Brewery shaft lights had been repaired by the Wednesday work teams and they were duly lowered down the shaft. Our visitors on both days were taken on conducted tours of the shaft top. Everyone seemed very impressed. Meanwhile, we had heavy rain showers. Sunday visitor numbers were better and we had a busy day. Not content with being a Grumpy Miner, Titus also enlarged his performance by introducing a song. (underground). 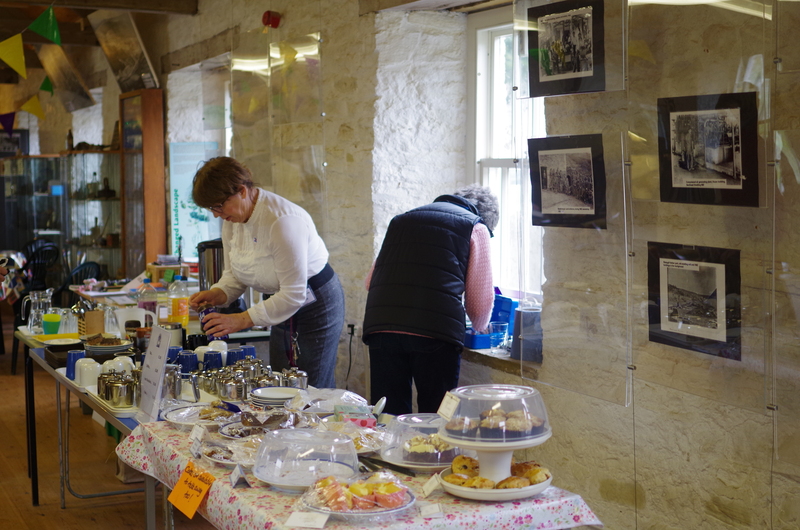 On both days we sold cakes and tea , books , identified mineral specimens , ate original old style miners bread, and sampled home cured bacon. It rained. Our roving photographer kept emerging from darker corners of Carrs Mine -and we are adding to our stock of good publicity photos. The total donations for the weekend were just over £600. It rained some of the time. Raining whilst we were working on site today – but warm. The weeding team removed thistles, and other unwanted vegetation. Four large bags filled by the end of the day. 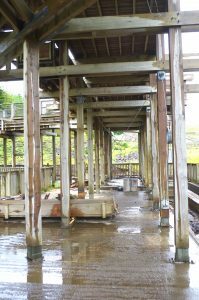 At the Power of Water, the water chute, blowing engine and assorted timbers were all removed. The base area has also been cleaned up and scrap material stacked ready for removal. At the east end of the structure, we have started preparations to dismantle more of the structure. The objective here is to make the top of the structure inaccessible to children. 23rd JULY – Best Open Day this year! Sunday 23rd July was a very successful Open day. 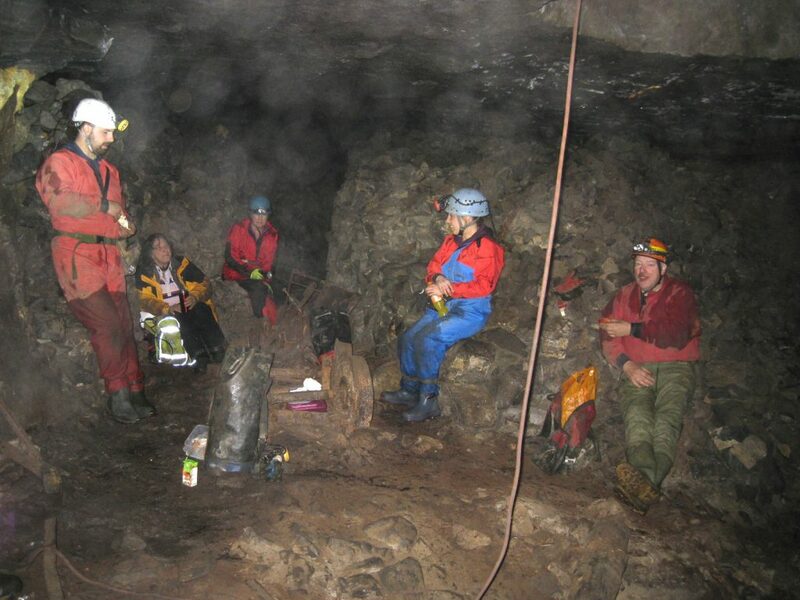 Despite cloud and rain, we ran seven trips into Carrs Mine and entertained 58 visitors underground. Cakes, tea and coffee all in great demand. 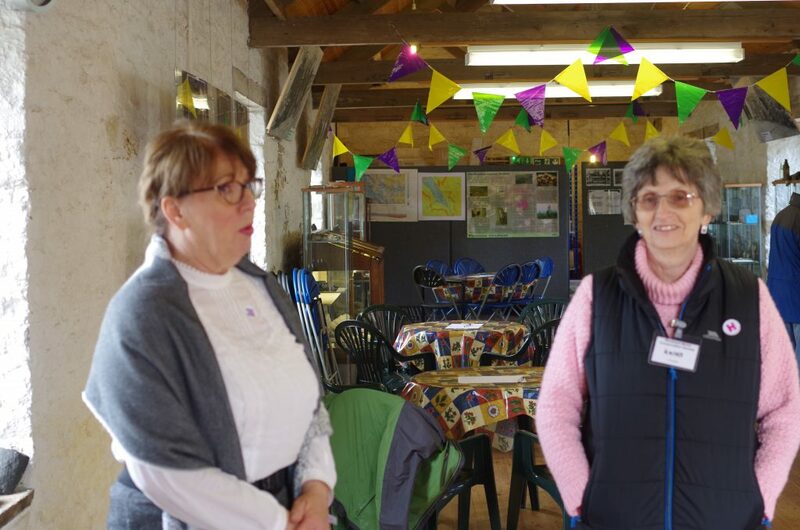 None of this would have been possible without our Volunteer team who provided receptionists, served tea and cakes, washed the crockery, guided visitors underground and added new artefacts to our interpretation (amongst many other tasks). Dawn temperature zero and climbed to 6 at midday. No wind, blue sky, a great day to be out on the North Pennines. 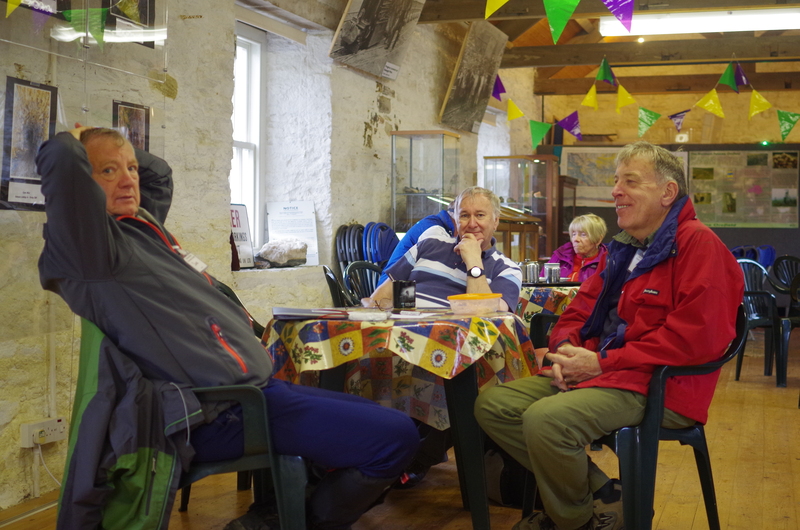 Graham, Alec, Steve and Pete did yet more moving and tidying downstairs in The Barracks. The Eimco and the Darlington winch are now in the middle of the floor, on boards, and can be worked on during the winter period. Our end of day task was to sort out and tidy up the welly stock. Graham and Alec also repaired the Smelting Mill safety fence where the railings had been removed by persons unknown, probably the same people who ride mountain bikes on the site. Jim removed the old mine power connection from Carrs Shop and also took out some of the old phone connections. 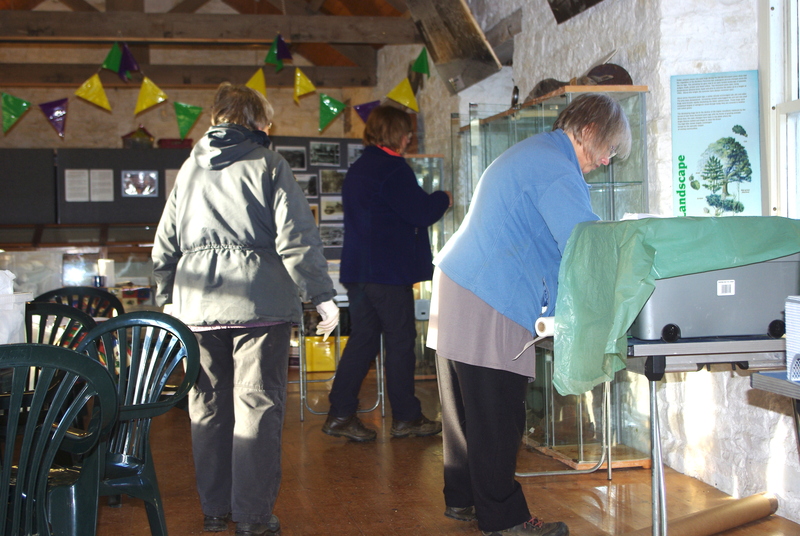 Sheila, Liz and Joyce spent the day cleaning and packing our small artefacts collection and they also reviewed our storage area and made some more space. We are planning to redesign the whole of the artefacts display during the winter closedown period. We had a drop in visit from two eminent Coal Authority people and we also hosted a visit from the County Council team who are responsible for the electrical systems. Plans are afoot to inspect the safety of the mains distribution cables. Sheila, Joyce and Liz wrapping the small artefacts. Joyce Jackson and Sheila Barker continued the marathon task of cataloguing and sorting our archive. We plan to upload part of the index to this website shortly. researchers will then be able to arrange to view items from the list. 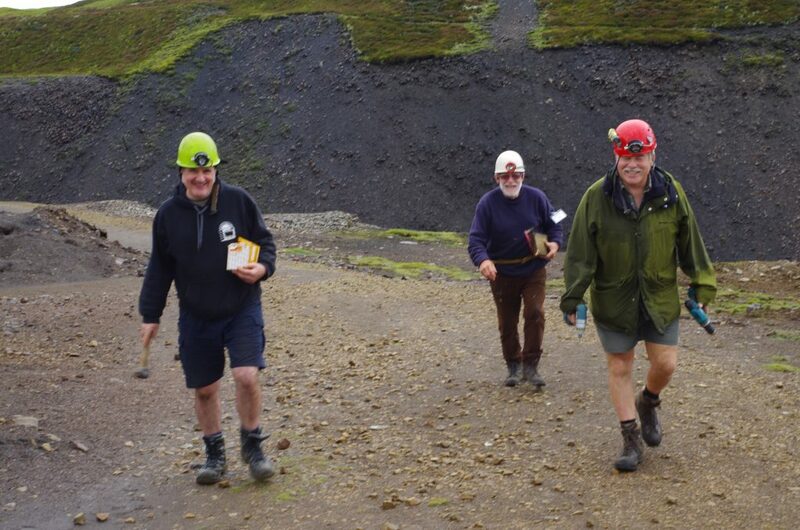 Alec Langley, Graham Brooks, Jim Coxon, Colin Wilkinson and Peter Jackson retreated from the damp and cool climate into Carrs Mine. They spent six hours removing the remains of the cable and lighting installations, including every clip, screw, nail and tie. This work required close inspection of walls and roof which led to the discovery of a large rock showing signs of movement. Our risk assessment indicated that the rock was likely to drop at any time and was apparently held up with a clay joint filling. Two people required to move and stack it after we had barred it down. A further inspection has not revealed any more mobile rocks. A review of the dam in the mine shows that our emergency work to reduce the water flow continues to be successful – a much reduced water flow from the drain valve.